Pest Size: A skunk can be the size of a large cat. Hazardous Level: Skunks are dangerous if provoked. Also you're going to smell bad for a few weeks if you get sprayed. Skunks also carry rabies (it's rare in Ontario but possible) so if you are bitten or scratched, seek help immediately. 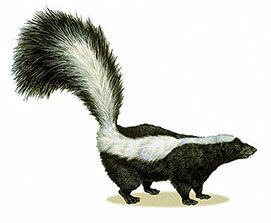 Skunks can be easily identified by their odor. 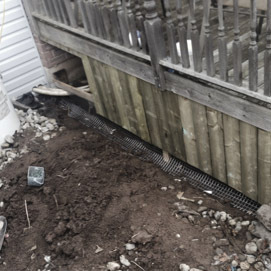 They may also cause damage to your property by digging holes or raiding your garbage cans. 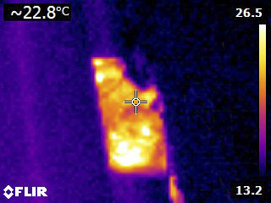 Typically skunks like to make their homes under porches sheds, and decks. It is very important that you DO NOT corner a skunk or try to get them out yourselves. There are two ways of dealing with this problem. Digging around the structure to prevent the animal from digging its way back in and installing a one way door. Are Skunks hazardous to humans? Yes. Skunks can be dangerous if provoked. Skunks carry many diseases such as rabies. Keep yourself and your perts at safe distance as Skunks can be aggressive. 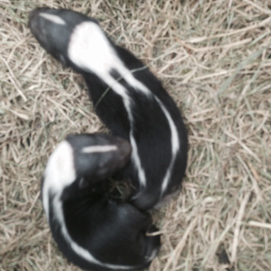 How can I get rid of Skunks, such as skunk removal from under my porch? It is recommended to seek the services of us in the Hamilton, Toronto, Guelph and Kitchener regions of Southern Ontario, or a trained Pest Control professional to eliminate pests for thorough results. We will remove the skunk, and will recommend to prevent further skunk visitors, such as bringing your pet's food bowl in before dusk, maintaining better compost and garbage techniques and managing locations such as woodpiles and culverts where skunks like to hide. There are many commercially available products that will assist in getting skunk odours out of your dog. Follow their instructions carefully, and avoid getting any product near their face. As skunks are generally nocturnal, the stores where you buy these products are often closed. There are lots of remedies online, which if you use, have some common sense. Even if these remedies contain common household products, keep them away from your dog's eyes and face. The best solution is to take your pet to a vet. You may have to walk her as if you put a skunky dog in your car, your car will stink for months to come. What do I do if I'm sprayed by a skunk? We recommend you always call us to remove a skunk from your property, but sometimes people need to learn this the hard way. If you are sprayed, generally your clothes get the most damage. We recommend you remove all clothing items sprayed before the smell reaches your skin. If you've been sprayed in the face, visit a doctor as soon as possible. Using online home remedies can always be a little dangerous and unwise. Does tomato juice work in removing skunk smells? No, tomato juice baths do not work. The science behind it is that Tomato juice does nothing to change chemical structure of the skunk odour. Instead Tomato juice just masks the smell with a smell that is more powerful. While you still smell like skunk and tomatoes to everyone else, you don't notice the smell as you've essentially caused olfactory overload, where your nose has been bombarded by strong smells that it stops sending these senses to your brain. This is similar to if you cook with onions and garlic, at first the smell is strong, but with overexposure, you no longer smell anything, until you leave the kitchen for a bit. Help, there's a skunk stuck in my window well. Skunks are not good jumpers or climbers so they can easily fall into a window well and not be able to climb out. You can cautiously slide a wooden plank into the well that a skunk can use as a ramp to climb out. Help, there's a skunk in my garage. A skunk is likely to get into your garage at night time if you leave it open. We recommend you close your garage door before dusk. Also, remove any dog dishes of food and bowls of water in the evening that might attract skunks.